Monday is the start of the week that means I have to spend some time reviewing my audio-video mails where my tasks and important information are channeled. Replied to a comment from my recent comment. I am tasked to write about the perks and benefits of a regular and virtual employee. 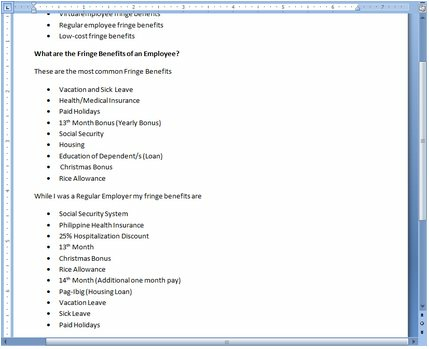 I infused the list of fringe benefits into this post, but I am waiting for a feedback if this is okay. I think in Asia, we have the most given perks and benefits but this post is mainly focused on the most common fringe benefits to a regular employee. Employers are obliged to give these benefits to compensate the employees services rendered to the company. Just like the saying goes “those who have less, should gain more” and this is one of the reason why we have these kind of benefits, but not all companies especially small company can’t comply to all these due perks. So, they look for other ways to compensate on their employees rendered services by giving bonuses. My internet is having another episode of incompetent service. That Yellow sign kept bugging me this whole morning and the internet fluctuates over and over for a couple of minutes.